This 3-combination tour includes a full-day ticket on a hop-on hop-off sightseeing tour, admission to the Eastern State Penitentiary, and a 75-minute Franklin Footsteps historic walking tour. Discover one of the most historic cities in the U.S on an open-top double-decker bus. Visit any of the 27 attractions, learn about the once most famous and expensive prison in the world, and retrace Benjamin Franklin's life and impact on American history. This tour makes frequent departures from the Northeast Corner of 5th and Market streets. 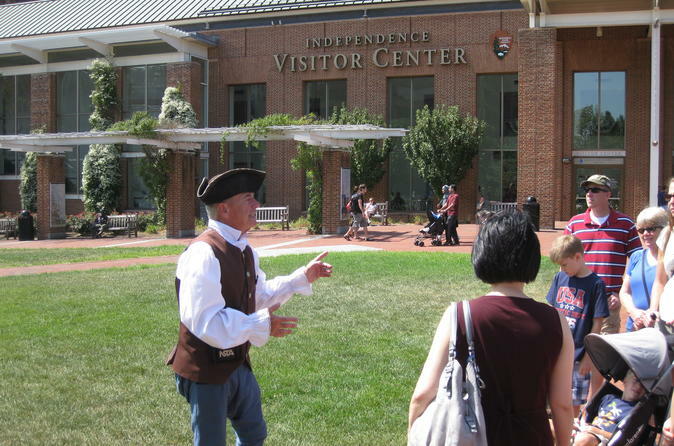 Climb aboard the double decker bus at the Sightseeing Tour Kiosk at the Independence Visitor Center and enjoy Philadelphia's history, cultural attractions, dining and shopping along the route. Hop on and off at any of the 27 stops or just sit back and enjoy the ride. See the steps that Rocky climbed, enjoy an authentic cheese steak or Philadelphia soft pretzel, celebrate Ben Franklin's 309th birthday, retrace the steps of our founding fathers, visit America's first zoo, or shop along South Street. Learn about American history through the footsteps of Benjamin Franklin on a 75-minute walking tour. As an expert historian guide leads you around the historic district, learn interest anecdotes and historical facts. Highlights include Independence Hall, the Liberty Bell and Carpenters’ Hall - where the Continental Congress met to discuss its grievances with England. Along the way, you will see Christ Church, where Ben Franklin and our Founding Fathers worshiped, the Betsy Ross House, where the first flag was made, and the Christ Church Burial Ground, the final resting place of Ben Franklin and many historic leaders. Also, you’ll learn about the National Constitution Center - the historic area’s newest attraction which explores the U.S. Constitution, a worldwide symbol of freedom and justice.